Packing is a hot topic in the travel world. Travellers the world over love sharing their packing tips and tricks, creating lists and trying to find the best ways to travel lighter and smarter. Last week in our giveaway post where we talked about our must-have packing accessory, we asked you to share your top packing tips with us and boy were we overwhelmed with so many awesome tips and tricks. We received over 50 comments from you guys which really made us chuffed! And speaking of the giveaway we need to announce who the lucky winner of the Zoomlite packing cube set is. Congratulations to Diane Henn from the USA. You should have a email already in your inbox which tells you how you can claim your prize. Thanks to everyone who entered, we wish we could have given you all a prize for all those wonderful tips you gave. So today I’m going to be sharing them all with you along with a few extra packing tips and tricks of our own to help you travel lighter and smarter. Of course this is going to depend entirely on how long you are travelling for and why you are travelling. A seven day resort vacation will require a lot less clothes than a one month multi-city trip. However, the general consensus on how much you should pack was to PACK LIGHT. We’ve always been of the opinion that just because the airline allows you to take 20kg of luggage doesn’t mean that you have to take 20kg. The less you carry, the easier it will be to get around and the more weight and space you will have to bring home things you find along the way. While Chuck has a simple way of looking at packing “you don’t need that”. A way of thinking we all wish we could adopt! 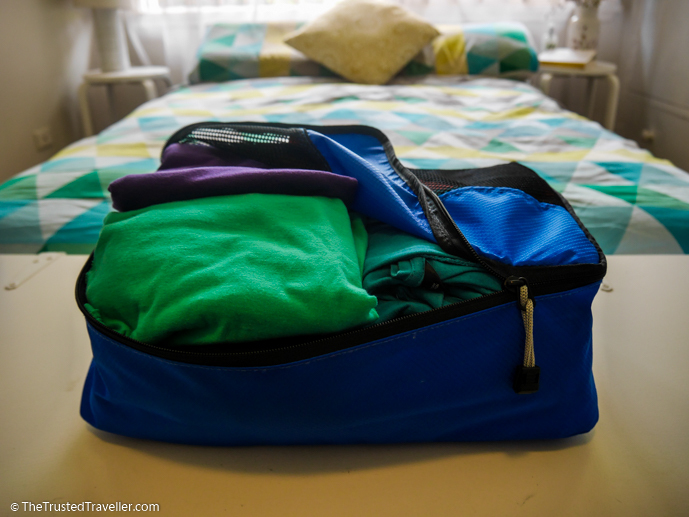 So what are a few of your strategies for packing less? 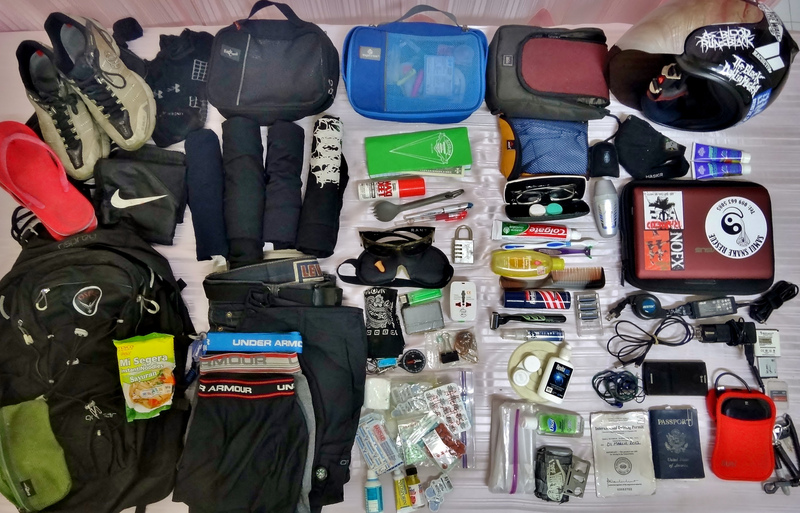 Heather the Kiwi Travel Writer suggests that you “Lay out your gear … then remove all that’s been added for “just in case””. Both Ashleigh from Paws and a Passport and reader Kerry have a similar strategy. Latanya said “Wear what you know you’ll wear!!! If you second guess, leave it.” This is the exact strategy we’ve been using for a few years now. Mum of four, Rebel says you should “Pack everything you THINK you will need. Take away half. Take away half again. Remove three more items … and you will still probably have too much! Packing conservatively never broke anyone’s back at the luggage carousel.” Very true and wise! What’s the Best Packing Method? 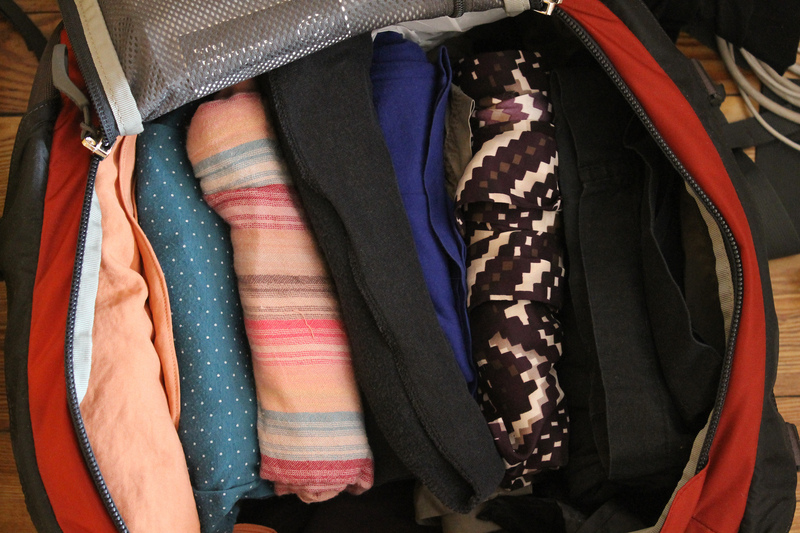 The hands down winner for the best packing method was without a doubt rolling your clothes. And we 100% agree. 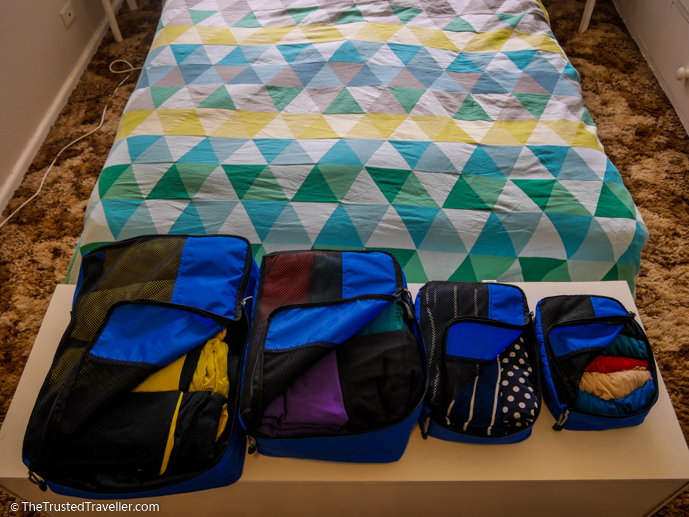 This is an especially good strategy if you are using packing cubes (like the Zoomlite ones that we love). Brian from Adventures of Brian, and readers Anna and Teresa all said that rolling was the only way to go to help you save space. 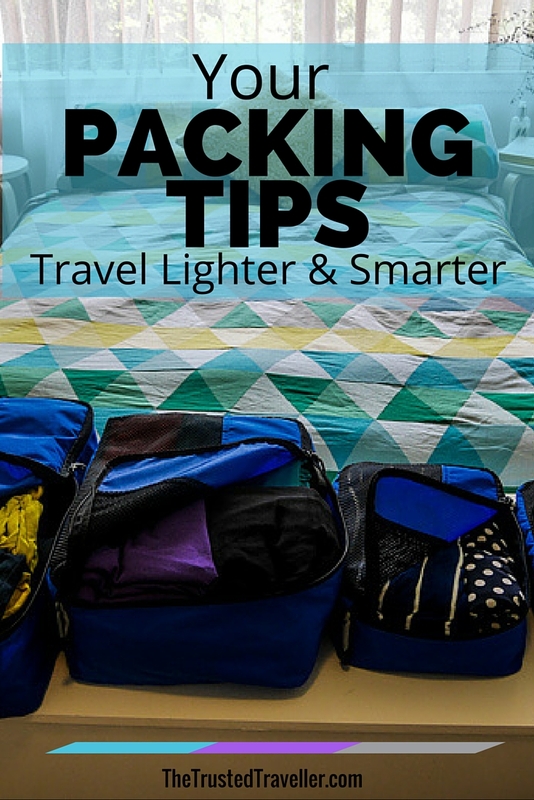 We got lots of great packing tips that will help you be prepared. Susanna says you should “Check the weather at your destination and pack accordingly!” No need to pack that over-sized coat just in case if the weather is consistently warm and sunny. Erin from Traveling Thru History likes to “do laundry 3 days before any trips and then pack as I’m putting clothes away. After I’ve thrown in all the clothes I think I need, I take it all out and put it in outfit piles and see what I can mix’n’match and reduce.” This is something we do too. Our favourite being prepared packing tip came from Vicki from Voyager Vicki. She said “I leave my bags constantly packed with travel-sized toiletries, cords/battery chargers/other tech stuff, laundry bag, etc. so I just need to pack clothes and accessories for each trip.” We think this is a great idea for frequent travellers because it saves so much time and eliminates to chance for you to forget something. Apart from rolling your clothes, one of the biggest space saving and weight saving tips we use on every trip is to use little bottles for liquid toiletries. Sharon from Leaning Into Life agrees, “For toiletries, look for bottles smaller than the 3-ounce airline-approved size. I really don’t need 3 ounces of shampoo / lotion / makeup for a 2-week trip. And contact lens cases work well for holding moisturizer or vaseline to rub on sore feet. Every little bit of space saving helps!” Would couldn’t agree more Sharon. Packing multi-functional pieces was mentioned time and time again. The topic of carry-on luggage came up a fair bit too. A few of you said that you like to pack an extra outfit in your carry-on in case your bag doesn’t arrive with you. Thanks Molly, Angel and Diane for this important suggestion. Paula from Sydney Expert does the same thing but adds “As a woman with above average size chest, I am very careful when packing for Asia as some items of clothing can be hard to get in my size. 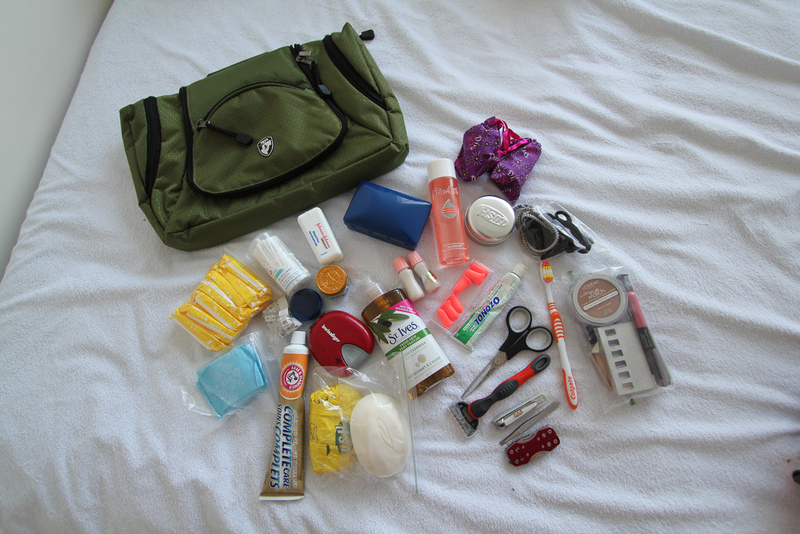 I tend to pack things like swimmers and bras in my carry on so if my bags are lost I can get by with men’s clothing and my essentials.” This is something I must remember to do myself on our next overseas flight! We’ve always packed a few spare plastic bags for dirty clothes and shoes. This way you can keep your clean clothes smelling clean and free from dirt and dust. And a lot of you agreed. Maureen has a genius idea to “cover shoes with disposable (freebies from hotels) shower caps.” LOVE THIS! Terri and Alice both use zip-lock bags to separate liquid items. “Let’s just say I had experience with the contents of a can of mousse that got over everything”, said Alice. Thanks again to everyone who contributed these excellent packing tips. We love getting your input into things and can’t wait until the next time! For more posts like this, check out our Travel Tips page. 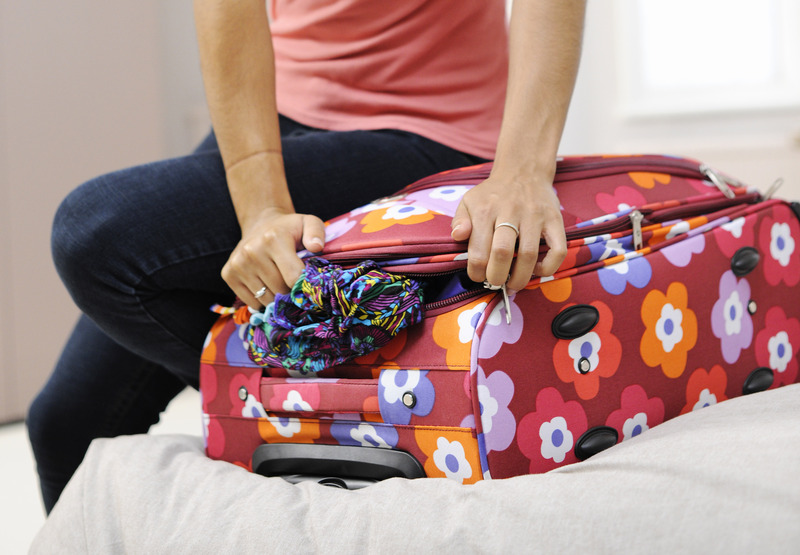 Do you have any packing tips that have been missed in this post? What a great collection of tips! I really need to try to incorporate a few of these on my next trip. I really need to work on the “just in case” pile. Thanks Paula and thanks too for contributing. I’m a just in case packer too and agree it is something I must work on. I was never a fan of packing cubes. I never got the point. This was when I was doing 4 day city breaks, so packing cubes would be a bit over the top for a backpack. I am now on holiday in Sydney with a suitcase and my case is a nightmare. I think they are definitely to way to go to keep your bags neat and tidy. Save old underwear and other clothes to take on vacation. Pitch them after they have outlived their usefulness (hiking, etc.) as you go, making room for anything you might acquire along the way. Great idea Deb. That would definitely help you travel lighter. Thanks for mentioning me in your post! 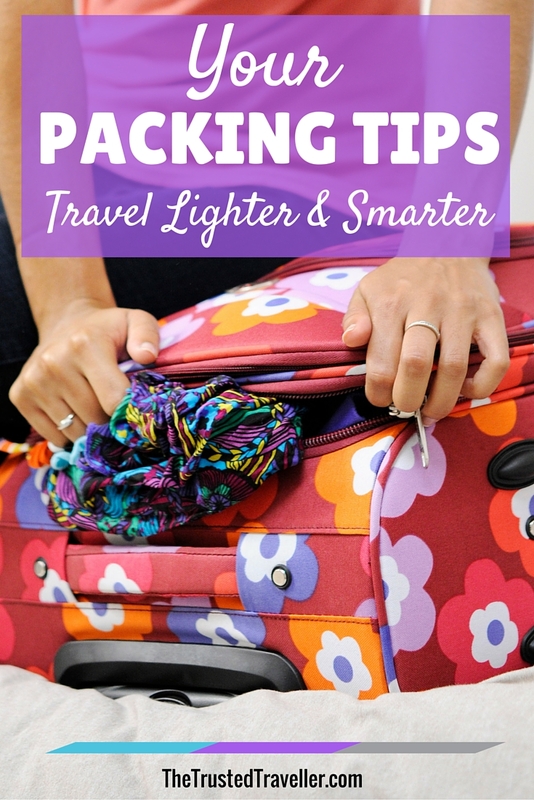 Excellent tips for packing and traveling light. I love how you used everyone’s suggestions and organized them. It’s great to get many points of views from all different travel situations! If taking a trip of several weeks or more, I have found that a roll of duct tape can serve many useful purposes. Thanks Ron. Interested to learn more about the uses of duct tape. These are awesome tips, very awesome. They will come in handy next time I travel. Wow Your tips is very useful for me. Whenever I go out for a picnic or a roam, my problem is packing. How to pack my stuff? I got your blog and I get the some valuable tips on Packing. Thanks a lot for this beauty Enjoying article with me. I appreciate it very much! That’s quite an interesting article about minimalist packing , and I find it really useful, As a corporate traveller, packing things is literally hectic work, and I am going to follow your tips for my upcoming travels. Hope this packing trick could save some space on my air travel. Thanks Gloria. Best of luck packing light!